« The Future Does Not Exist Outside Your Mind. 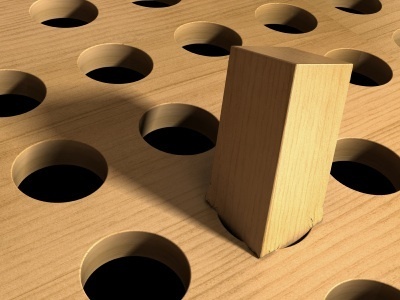 Square Peg, Round Hole: Why Forcing Yourself To Be Something You’re Not Feels Bad. A few days ago, we asked that you let go of the need for other people to be different. Today we ask you to let go of the need for you to be different. One of the greatest forms of wisdom to cultivate is knowledge of who you are. Everyone is different. Everyone is unique. You have a unique pattern, a unique energy signature. Only you possess this pattern. You can think of this pattern like the different shapes in a child’s block set — square, circle, triangle, rectangle, and so on. Part of the key to enjoying life is understanding what shape you are, and not attempting to force yourself into a slot where you do not fit. A square block cannot fit into a round hole. A rectangular block cannot fit into a triangular hole. Certain shapes are complementary. They “fit together.” Other shapes do not fit together now matter how much one shoves. You cannot force these things. And yet people are always trying to force themselves into jobs where they do not fit, and into relationships where they do not fit. These mismatches never work, in the long run. You know when something is a good fit with your personal energy signature when it feels good to you. When it feels energizing, not draining. When you do not feel compressed, or forced, or conflicted. That is a sign of a good fit. It is good to know who you are. What your shape is. What feels good to you. What excites, and energizes you. The kinds of environments in which you thrive. When you are being yourself, there is a sense of relaxed, yet energized presence. No energy is being drained by the attempt to be something you are not. Think how much energy it takes for a square to pretend to be a triangle!